Ferguson Library is your hometown library, serving our community since 1930. Fine limit per item is $5. For Ferguson residents unable to visit the library because of advanced age, illness or disability, we offer homebound services on a long-term and short-term basis. This service can also be utilized by the homebound individuals caregiver. Call Rachelle @ 314-521-4820 for more information. From bestsellers to the daily news to blockbuster movies, we have something for everyone! If you need help finding an item, let us know or visit our catalog. Through our membership in the Municipal Library Consortium, items that are not immediately available at our library can be requested and sent here, free of charge. Our Children’s Room has a wide selection of picture books, nonfiction, and chapter books, and features our ever-popular Step into Reading collection to help our youngest readers. We also have an extensive Young Adult section with the latest hot series, stories, and characters that teens can’t live without. We offer a variety of magazines, including Time, People, Glamour, and more. Newspapers include The St. Louis Post-Dispatch, The St. Louis American, USA Today, and other national newspapers. Our DVD collection features award-winning films, classic movies, big blockbusters, and favorite TV shows. If you think our collection is missing a book or movie that is a “must-have,” then please ask us about a Request for Purchase form. We have a total of 12 computers for patrons to use, equipped with Microsoft Office products for all your document-creation needs. The Library has 10 MB fiber-optic circuit for fast access to the Internet, and each computer has a variety of Internet browsers to choose from. You must have a valid library card in order to use our computers. For those without a library card, we have a 15-minute-only computer available for use with a guest pass and a picture ID. We also offer Google Chromebooks for Internet browsing. You do not need a library card or guest pass to use the Google Chromebooks. Our Children’s Area features 4 computers for use. With adult permission, children and teens may use their library card or request a guest pass in order to use the computers. A child’s use of the Internet is to be supervised by their parents or guardian. We also offer free WiFi throughout the building. We offer faxing at our self-service copy machine. It costs 50¢ a page to fax to both local and long distance numbers. Unfortunately, we are unable to fax to international numbers. We can also receive faxes. It costs 50¢ a page. We have two meeting rooms available free of charge for nonprofit and community organizations to use during regular library hours. We must have an application on file for your group to reserve a room. We offer printing in both black and white and color from our computers. It costs 10¢ a page to print in black and white, and 50¢ a page to print in color. We also offer photocopying in black and white for 10¢ a page. Our self-service copy machine is also capable of scanning documents and sending them to an e-mail address for free. From children’s storytimes to teen activities to adult-oriented presentations and programs, Ferguson Library provides activities for all ages. Check out our latest events here! Common tax forms and publications are available during tax season at the Library. If you know what form you need, we can also help you access them online. Mail-in voter registration forms are available at the Library. We can also help you access the online form. Ferguson Library is a member of the Municipal Library Consortium, with over 700,000 items held by member libraries. 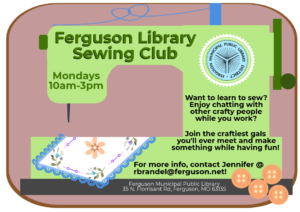 You may checkout materials at any member library using your Ferguson Library Card. Member libraries are Ferguson, Brentwood, Kirkwood, Maplewood, Richmond Heights, Rock Hill, University City, Valley Park, and Webster Groves. You may request materials to be sent to Ferguson for pick-up. Ferguson Library will borrow materials for Ferguson residents that are not available through the Municipal Library Consortium. Please contact us for more information.